Goalkeeper Robert Green saved an injury-time penalty from Jermain Defoe to ensure West Ham earned a point in a thrilling clash at Upton Park. Tottenham centre-half Michael Dawson had hauled Spurs level with a header in the 66th minute after a first-half blunder by Younes Kaboul had allowed Carlton Cole to open the scoring for the Hammers. But former West Ham striker Defoe earned a controversial penalty when he was brought down by Lucas Neill in stoppage time but the Spurs striker's spot-kick was kept out by Green. Tottenham began the game brightly and had a goal ruled out for offside as early as the fourth minute after goalkeeper Green could only parry a shot from Jermaine Jenas into the path of Aaron Lennon. The England winger tucked the ball away from eight yards but was immediately flagged offside. Tottenham had a penalty appeal rejected in the seventh minute when Dimitar Berbatov appeared to be tripped inside the penalty area but referee Mike Riley was unimpressed. In the 12th minute West Ham striker Carlton Cole found himself in the book for leading with his arm when challenging Gareth Bale. Three minutes later West Ham defender George McCartney almost scored an own goal when he connected with a free-kick from Jenas but, much to his relief, the ball went inches wide. But West Ham went in front in the 19th minute then they took full advantage of a dreadful defensive lapse by Kaboul. The Spurs centre-half tried to pass the ball upfield but his clearance hit Luis Boa Morte who burst into the penalty area before finding Nolberto Solano with a clever reverse pass. Solano shaped to shoot home from an acute angle but instead cleverly laid the ball across the six-yard-box for the unmarked Cole to place into an empty net. In the 23rd minute Hayden Mullens tested goalkeeper Paul Robinson with an 18-yard drive which the England stopper had to collect at the second attempt. West Ham were prevented from increasing their advantage in the 26th minute by a stunning save by Robinson. The England international, controversially axed by former boss Steve McClaren for the 3-2 Euro 2008 qualifying defeat by Croatia that cost him his job, saved at point-blank range from Boa Morte. Moments later Berbatov should have done better for Spurs when a cross from Bale was misjudged by Mullins, but the Bulgarian failed to the hit the target from the edge of the six-yard-box. West Ham carved open Tottenham again in the 38th minute when Solano burst into space inside the penalty area. He allowed Boa Morte to cross the ball for Matthew Etherington to try his luck with a header from six yards. However, the former Tottenham winger's effort was dealt with comfortably by Robinson. Referee Riley was at the centre of controversy five minutes before the break when he refused to award Spurs a penalty. Tottenham midfielder Zokora had found the unmarked Robbie Keane with a delightful through ball and the Irishman only had Green to beat in order to level the scores. The Spurs striker chipped the ball over the head of the West ham goalkeeper who then appeared to trip him. The ball flashed wide of the post and Riley waved away furious appeals for a penalty from Keane and a host of other Tottenham players. Tottenham wasted a glorious chance to level the scores in the 49th minute when an unchecked run by Jenas caused problems for the West Ham defence. Jenas eventually played the ball to the unmarked Steed Malbranque who curled his short around Green's left-hand upright. In the 62nd minute West Ham replaced Mark Noble with Scott Parker - making his first appearance since September after injury. But Spurs hauled themselves level in the 66th minute when a free-kick from Jenas was headed into the net off the underside of the crossbar by defender Michael Dawson. In the 77th minute a break down the left flank by Bale almost brought Tottenham further reward. Bale's cross was met by Malbranque who hit a rising drive straight at Green. Moments later Spurs replaced Keane with former West Ham favourite Defoe to the expected howls of abuse from the home fans. 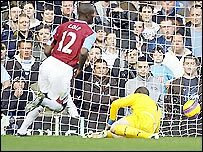 West Ham were still dangerous on the counter though and Cole sent a 20-yard drive flashing inches wide of the target in the 79th minute while Parker forced Robinson into a stunning save moments later. Jenas then had to clear a header from McCartney off the line in the final minute. Spurs should have won it in stoppage time, but Green had other ideas. West Ham Green, Neill, Gabbidon, Upson, McCartney,Solano (Spector 82), Mullins, Noble (Parker 63), Etherington,Cole, Boa Morte (Ashton 72). Tottenham Robinson, Chimbonda, Dawson, Kaboul (Bent 54), Bale,Lennon, Jenas, Zokora, Malbranque, Berbatov, Keane (Defoe 78). Booked: Zokora, Chimbonda, Dawson, Defoe.